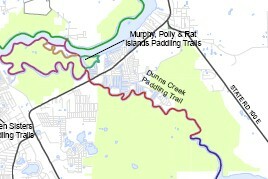 Dunns Creek paddling trail is 6-mile long deep creek linking the St. Johns River to Crescent Lake. It averages 100 yards wide the entire length of the creek. The Dunns Creek Bridge of Highway 17 passes over the waterway near its connection with the river. Murphys Creek and Rat Creek are connected at the northern mouth. The shoreline is largely uninhabited except for the first two miles on the eastern shore. SJRWMD manages the Dunns Creek Conservation Area on 5 miles of the eastern shore of the creek. Dunns Creek State Park is located on the western shore for nearly its entire length. At Pine Landing, the State Park offers picnic tables, artesian well water and restrooms. Beautiful wetlands, cypress trees and lily pads are viewed. The waterway is subject to strong tidal flows. Small developments are located near the river on its eastern shore. 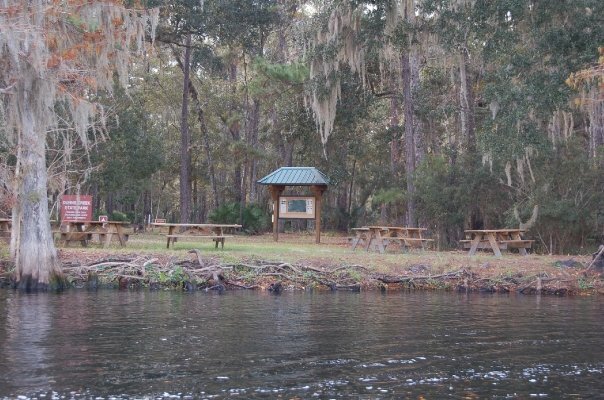 Dunns Creek State Park’s Pine Landing is located 5 miles from the river. Dunns Creek is best known for its catfishing and its connection to nearby Crescent Lake. Many species of birds and animals live on the shores of Dunns Creek. Manatees regularly travel the waterway and the American alligator grows large in these waters. Cypress trees, hardwoods and lily pads line the entire trail. There are two public landings available and several private landings. There is an unimproved soft landing underneath the Highway 17 Dunns Creek bridge with plenty of parking space. Dunns Creek State Park has a soft landing but the park is not open to the public except during Open House events. Georgia Boys Fish Camp just off Highway 17 has a landing, rooms, snacks and fishing gear. Dunns Creek is 1.5 miles from Brown’s Landing in Palatka. Because of the width of Dunns Creek, it is recommended that paddlers keep to the beautiful shorelines. There is no marked channel and because of the motorized boat traffic, caution should be taken. Since the waterway is subject to swift tidal flow, it is recommended to verify tide information before you cast off. List of landings with GPS coordinates will be available on the county’s website and in brochures.